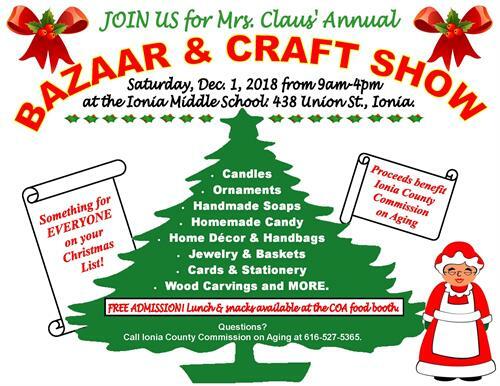 Join us for the annual Mrs. Claus Bazaar & Craft Show on Saturday, December 1st from 9:00am-4:00pm at the Ionia Middle School, 438 Union St., Ionia. Free Admission and Door Prizes throughout the day! Lunch and snacks will be available at the COA Food Booth. Proceeds benefit the Ionia County Commission on Aging.